To cast on for circular knitting, you use the same sorts of cast-on stitches that you do for traditional straight knitting. But with circular knitting you do have to make some changes, depending on the kind of needle you use. Circular needle: Before you start to knit, make sure that the cast-on edge isn’t twisted around the needle; if you have stitches that spiral around the needle, you’ll feel like a cat chasing its tail when it comes time to find the bottom edge. The yarn end should be coming from the RH needle tip. Double-pointed needles: Casting on and getting started on a set of double-pointed needles can be a little trickier than using single-pointed needles. 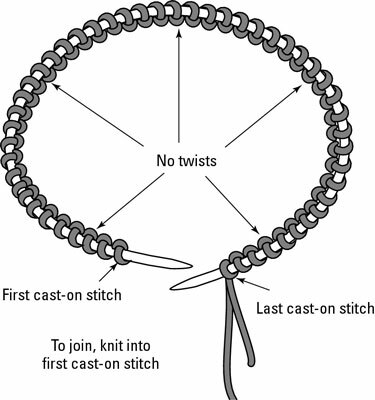 Instead of trying to cast all your stitches onto one small needle (which increases the likelihood that some will slip off the other end) or several separate needles (which leaves needles dangling and extra yarn at each needle change), cast the total number of stitches needed onto a single-pointed straight needle of the correct size. Then slip them purlwise onto your double-pointed needles, distributing them in equal or close-to-equal amounts and making sure that the stitches aren’t twisted around any of the needles. Leave one of the needles free to start knitting. If you’re using a set of four double-pointed needles, use three needles for your stitches: Form them into a triangle with the yarn end at the bottom point. Save the fourth (empty) needle for knitting. If you’re using a set of five needles, put your stitches on four needles and knit with the fifth (empty) needle.